Big-ups to Vic Taplin and Ding for writing a Fantastic Four joke that ∗I∗ wish I would have thought up! There’s is guest strip numbero dos in a full week of guest strip offerings while I am relocating headquarters to a new house about five minutes away from where I am typing this now. Thanks to Vic and Ding for their contribution. I got a real kick out of their comic. Hey! It just occurred to me that maybe YOU should thank Vic and Ding for their help this week by visiting their web comic! It’s called Blues and Twos and they’re just getting it off the ground. But bookmark it now so you can check it out later. I think their efforts today prove that what they have cooking will be good! I didn’t have a chance to see Fantastic Four this weekend, but I was very impressed by it’s $50+ take at the box office this weekend. You have to assume that the aggressive marketing campaign had a lot to do with it. The reviews have certainly been less than kind. But with an opening that strong, a sequel will surely happen. Maybe they can find a different director and tweak the problems that so many have been grousing about. I’m eager to see it, but keep my expectations cautiously reserved. The movie I’m REALLY looking forward to this week is Wedding Crashers. From everything I’ve heard, the dialogue is whip smart and Vince Vaughn knocks it out of the park. This seems to be a role written specifically for the charming schemer persona he’s been grooming since Swingers. But I imagine there will be plenty of time to discuss the film in the next coming days. I have strips lined up every day until Sunday, so be sure to come back for more! My original sketch was supposed to have the entire Fantastic Four in a groups shot. Since he’s the most awesome, I drew The Thing first. 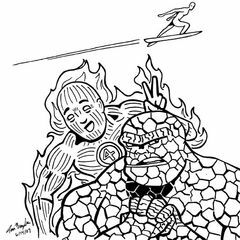 Then, as I got to thinking about it, the one aspect I love most about the Fantastic Four is the ribbing that The Thing and The Human Torch give each other. 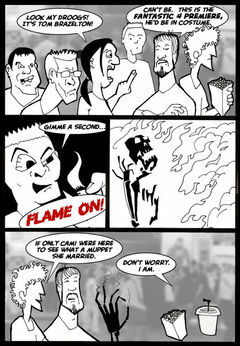 In the comics, it’s merciless and in the first movie, it was actually one of the few things that they got right! So I put my focus on these two and left The Invisible Woman and Mr. Fantastic out of it. Their dynamic never really interested me much. Above the two is The Silver Surfer flying out of frame. Originally, I needed something to fill in some white space, but I really like how it turned out. I think I was able to capture one of his poses with only a few lines and that’s a good feeling. Commercials for the new movie are everywhere right now. I can’t turn on a TV without seeing one. I think it was all over MySpace yesterday. And even though Jessica Alba still looks like a man (seriously, I saw her Adam’s Apple!) and some of the TV spots are showing Galactus-as-a-cloud, I’m psyched to see it. I mentioned on Wednesday on how Cami is letting me off my leash and how I’m seeing it by myself. I think we figured out how. I would have felt guilty to leave her and Henry alone on Saturday or Sunday during the day and especially during the evening. I probably wouldn’t even be able to enjoy the movie because I would be paranoid that Henry would say his first word, or something, while I was away. It would probably be “deadbeat,” or something similarly heartbreaking. So I suggested that I go to the late-late show on Friday night. We typically put Henry to bed around 10:00. Once he’s down for the night, I’ll sneak out of the house to hang out with a couple hundred nerds for two hours and then slink back into bed while Cami is still asleep. I don’t mean to make a big deal out of seeing a movie alone. I’m an only child, so doing stuff by myself isn’t alien to me. But with movies… well, for Cami and I, it’s been the nucleous of our relationship for almost 13 years. So it’s just weird when I go to one without her. There’s a chance I might go with my sister-in-law. I think Cami told me she was interested. But probably because she just moved into a new townhome and wants to get away from painting for a few hours. I’ll have to confirm that. All the same, it’s probably for the best Cami isn’t going. She’d probably be too distracted by Alba’s hairy knuckles to enjoy the movie anyway.